Sailors like to debate storm tactics. A generation ago some were arguing in favor of lying a-hull, others for heaving-to, others for the wisdom of towing warps and running before it. While no one is extolling the virtues of lying a-hull any more, the argument still goes on and to this day no treatise can claim to have resolved the issue conclusively. The writings of the most noteworthy sailors of history leave the question in part unanswered, as does the legendary masterpiece of K. Adlard Coles, Heavy Weather Sailing. Nowhere in his writings was the late Adlard Coles dogmatic about any particular method of negotiating gales at sea. Indeed, in all respects he tried to leave the issue open, recognizing that he himself did not have all the answers. No one has all the answers. The issue is not an easy one to resolve. It involves many different types of boats in many different types of sea conditions. The advent of modern sea anchors and drogues may have revitalized the debate, but it has not resolved it. In November 1994, for example, someone posted a question about drag devices on Compuserve's Sailing Forum (Section 2, Seamanship and Safety). This led to a twelve-month-long heated debate about the uses of sea anchors and drogues. Numerous sailors from all over the world, among them seasoned veterans and renowned safety experts, jumped in with feedback, opinions, observations, prejudices and disagreements. In the end, however, all the exhausted participants more or less agreed that seamanship is a continual learning process and that there are a great many things that are yet unknown. The marathon debate was subsequently "packaged" and placed in the Library Section of Compuserve's Sailing Forum. The megabyte-size file (three hundred pages of printout) is called Thread on Drogues & Sea Anchors. It can be downloaded and perused at one's pleasure using Compuserve's Windows-driven software: just hi-light the item and click on "retrieve." We must not give up trying to improve our skills and equipment so that the tragedies of the past are not repeated in the future. We must not allow outdated or misinterpreted stories to shackle us to fatalism. We must learn to reinterpret old stories, and even write new ones, in light of new challenges, new data, new experiences. `Another Fastnet' is always possible, but it is ever less likely if we learn from the experiences of those unlucky men and women who were caught out there, and who suffered so badly in that terrible storm. The lessons that will help us improve our boats, our gear, and our seamanship are there for us all to learn. In inquiries of every kind there are certain first principles on which all subsequent reasoning must depend. Do we have any useful first principles relating to vessel design and seaworthiness? Indeed we do. Round up a dozen naval architects and ask them if they design their boats to take the seas on the beam, and the answer will be a resounding "no!" We have to start on the correct premise that boats are not designed to negotiate the seas beam-on. Ninety-nine percent of all vessels (including large ships) are in fact designed to negotiate heavy seas with their pointed bows. It is the low buoyancy, knife-like bow of the boat that offers the least amount of exposure to the force of the sea. When a vessel is facing into the seas she has her shield up, so to speak. When she does not, the shield is down and the former protection is no longer there. The problem, of course, is that although boats are designed to penetrate the waves with their bows they will not face into the seas when disabled. All boats in existence (or at least 99% of them) will want to fall off the wind and let down their guard at the worst possible of times. One might say that the average sailboat is in many respects like the stubborn Grand Canyon mule that insists on walking along the very edge of the precipice, with a nervous tourist on his back. The moment that the sails are lowered, or steerage is lost, or the engine conks out, the stubborn creature will fall off the wind and edge her way towards the precipice. No sooner disabled than she will let down her guard and expose her vulnerable broadside to the waves. And she will remain there, at the edge of that precipice, rolling in the troughs, rails buried, inviting disaster in the shape of a knock-down, capsize, or even a 360° "barrel roll." Most sailboats are just like stubborn mules in this respect. A sailor needs a whip, a spur, a bit, a bridle - a sea anchor or a drogue - to force the obstinate creature away from the edge of the abyss. One needs a method, a technique, a tactic that will make the stubborn creature do what one wants it to do, instead of always doing what it wants to do. Vessel on the left is properly aligned and is far better poised to survive a storm than the vessel on the right. CLASSIC PREAMBLE OF HEAVY WEATHER SAFETY: Boats have to be forcefully brought into alignment by some clever, auxiliary means. In some instances this may involve the use of sails, as with the proven tactic of heaving-to. In other instances it may involve the use of the engine. Commercial fishermen call this jogging into it. When a commercial F/V runs into a gale offshore the captain will usually place the engine in slow-forward and use the minimum number of RPMs that it takes to maintain steerage and keep the vessel facing into the seas. Many a sailboat skipper has done the same thing, with the wind up and the mainsail in ribbons. More recently, however, the "clever auxiliary means" has come to involve the use of drag devices - sea anchors and drogues. Nowadays more and more sailors are using the tether of large sea anchor to pull the bow of the stubborn creature into the teeth of the gale, or the bit and bridle of a smaller drogue to keep her passions restrained as she tries to careen and cavort down steep watery slopes out of control - whoa girl, whoaaa! Both tactics are in widespread use today. Which one is better in a given seaway? When is it wiser to use a "sea anchor" off the bow? When should one consider using a "drogue" off the stern instead? The authors hope to shed considerable light on this difficult question in the subsequent pages of this publication. We said, "in inquiries of every kind there are certain first principles on which all subsequent reasoning must depend." Do we know of any useful first principle relating to the dynamics of the sea itself? It has to do with the so-called Trochoidal Wave Theory. 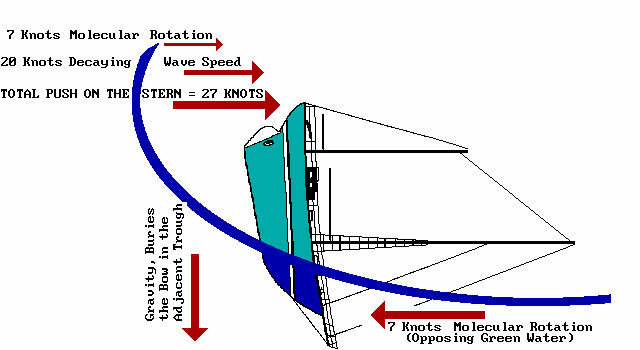 The subject of deep water wave characteristics is extensively covered in publications such as Oceanography And Seamanship (William Van Dorn, Dodd Mead 1974), American Practical Navigator (Nathaniel Bowditch, U.S. Navy Hydrographic Office 1958), Waves and Beaches (Willard Bascom, Doubleday 1980). We will not drag out complicated formulae here. Suffice it to say, however, that we need occasionally to remind ourselves that the motion of a wave at sea is not to be confused with the motion of a stream or river. Deep water waves are sometimes compared with the undulations of rope which is being moved up and down at one end. "Crests and troughs" will be seen migrating from one end to the other in wave formations. The transverse motion perceived is that of energy, and not that of rope fibers themselves. Similarly, the transverse motion of a deep water wave is also of energy and not the motion of the water itself. The water at the surface of a wave does not move with the wave across the surface of the sea. It merely rises up and falls down - actually rotates in small orbits, forward on the crest and backward in the trough, which motion, when viewed from afar, gives the illusion of real transverse motion. We have to start out on the correct premise that the sea is, for all intents and purposes, a stationary medium. The popular notion of "running with it" or "going with the flow" sounds plausible enough, until we stop and remind ourselves that most of the time there is no material "flow" to speak of. The waves that frequent the surface of the sea articulate the flow of energy, not the flow of water itself. It is one thing to run full bore down the rapids of the Colorado River, where the entire field of water is moving. It is another thing to run full bore in a gale at sea, where the field is more or less stationary. Even so, in every gale there is the perception that the whole field of water is actually moving. Because of this perception, there is often a false sense of security associated with running downwind. One gets the feeling that one is "going with it," as it were, and "not resisting nature." Not only is this perception itself false, but the false sense of security it evokes can be quite dangerous at times as well. Falling off a crest in the rapids of the Colorado may be harmless enough - rafters do it all the time, grandma and the kids squealing with delight. Unfortunately, falling off a wave at sea is an entirely different proposition. It is a very dangerous thing for a running yacht to fall off a wave at sea. Because the yacht does not land in a cushion of water that is moving at the same speed as itself. Rather it usually does a belly flop into a concrete wall of stationary green water. Remember doing that first painful belly flop off the diving board at summer camp? If so then you will understand why so many sailboats have received near death blows after falling off waves at sea. Which is the wiser course of action? To heave-to or to run with it? In attempting to answer this difficult question one has to bear something else in mind: Inertia is a two-edged sword. Unless they are actually breaking, which is very rare, sea waves do not impart significant amounts of net energy to motionless vessels. They do most certainly impart significant amounts of net energy to moving vessels, however. There is a principle of inertial augmentation that has to be considered here. This augmentation can, for all intents and purpose, be ignored when the vessel is stationary and hove-to. It cannot be ignored when the vessel is running downwind at great speed. Needless to say, we are dealing with the old familiar formula that relates force, mass and acceleration: F = ma (Force = mass x acceleration). 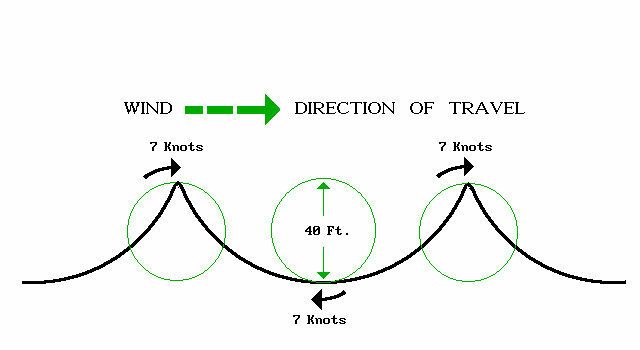 As the speed of a heavy vessel increases downwind, the inertial forces tend to augment themselves precipitously - along with the risk factors. Newton's 1st law states: Any body, once set in motion, will continue to move forward in a straight line with uniform velocity forever, provided it is acted upon by no force whatever. His 2nd law states: When any force acts on a moving body, its deviation from a straight line will be in the direction of the force applied and proportional to that force. Inertial augmentation is minimized when a vessel is stationary and hove-to. The augmentation curve begins to fluctuate wildly when the vessel is running unrestrained. What happens when a wave breaks? The reaction of a stationary vessel is fairly predictable, ignoring the possibility of structural damage. The reactions of a moving vessel, on the other hand, are anything but predictable. In the case of the stationary vessel we are dealing with one fairly straightforward reaction. In the case of a moving vessel however, we may be dealing with many unpredictable reactions. If the impact is squarely on the transom of a speeding yacht, the boat may get hammered down into the adjacent trough and pitchpole unexpectedly. If the impact is at an angle, the yacht may get "derailed" and make any number of dangerous contortions and/or maneuvers. Some boat designs are well suited to running downwind. A great many are not. Their dynamics can become all too complicated. The configuration of the rig, the position of the center of effort, the trim/ballast ratio, the prismatic coefficient, the shape of the buttocks, the underwater profile, the length of the hull's turning arm, the shape and position of the rudder assembly, the ever shifting position of the CLR (center of lateral resistance) all in all awaken a great number of unpredictable reactions from the boat that is running in a storm, any one of which can be her undoing. Although a high speed scream downwind can be extremely challenging, rewarding and exhilarating on a well-crewed maxi yacht, it may not be the wisest course of action on the short-handed cruiser. The behavior of a yacht that is running unrestrained in a gale is all too fluid, all too unpredictable. One needs the reflexes of a grand prix driver to keep things under control at all times. One needs to be as tireless as Superman as well. Racing boats may have a team of grand prix drivers - and Supermen - taking regular shifts at the helm, but the retired mom and pop about to cross the Atlantic would do well to learn the ancient art of heaving to. There are other risk factors associated with running, not the least of which has to do with rudder reliability. In order to maintain control while running one needs an effective rudder. Aside from cavitation or outright breakage, sailboat rudders tend to lose their effectiveness on wave crests. Because of the orbital rotation of the water molecules themselves, the blade tends to loose its "bite" on the crest of a wave, precisely where one needs a maximum amount of directional control. Have you ever tried to steer a sailboat down a canal basin or a river? If so then you will know how difficult it is to maintain steerage on moving water. This is so because the body of water is moving along with the boat. Water has to be flowing past the rudder at a sufficient rate before it can be used to steer the boat. The rudder tends to become sluggish where the water and the boat are moving together in the same direction. One runs into the problem of sluggish rudders on the crests of mature sea waves, where the water molecules are, briefly, moving in the same direction as the boat. There are other hazards associated with running before a storm. The most serious of these occurs when the height of a steep breaking wave matches the length of the boat. Sudden, unexpected, explosive, violent and catastrophic pitchpole is sometimes the result. Throughout maritime history a great many vessels have been pitchpoled while running. Not too many have been pitchpoled while hove-to and stationary, however. 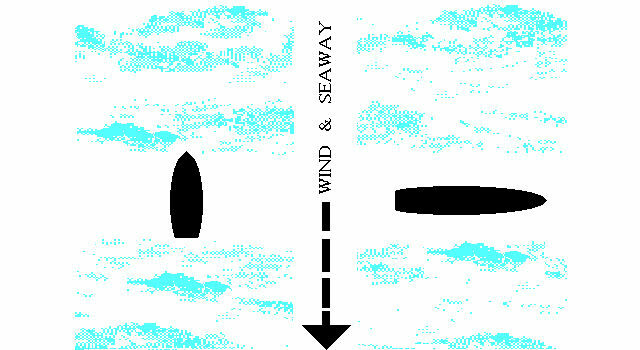 The diagram below shows a 40-ft. yacht being pitchpoled by a 40-ft. breaking wave. Whereas a rising tide will lift a boat vertically by a force equal to her displacement (usually many tons), a steep wave will "lift" the same boat horizontally with equal displacement force (DF) at wave speed. Speed of orbital rotation is already about 7 knots on the crest of a 40-ft. wave. The decaying crest hurls tons of water at a wave speed of 20 knots at her transom Force of gravity drives the bow down into the adjacent trough where it is briefly met with 7 knots of reciprocal rotation coming from the opposite direction. Result: The stern goes flying right over the bow without any hesitation at all, which is probably what happened to Tzu Hang in File D/M-1. But what if all the waves are breaking and the whole surface of the sea is in motion? Would it be safer to release all the brakes and go full bore then? The renowned French mariner Bernard Moitessier ran into a once-in-a-life-time phenomenon such as this in a prolonged Southern Ocean storm. At the time he was dragging a number of items behind his 40-foot Bermuda ketch, Joshua, a center-cockpit steel boat, with inside steering station. Describing the waves at the height of the storm as "absolutely unbelievable," he opted to cut away all warps/drags and run the "rapids" at full bore. Statistically speaking, however, the phenomenon witnessed by Bernard Moitessier in the high latitudes of the Southern Ocean - gigantic storm waves breaking "without interruption" for from 650 ft. to nearly 1000 ft. and "leaving acres of white water behind them," are very rare indeed. Other sailors who have made many circumnavigations have never run across such an occurrence. As far as the average cruiser is concerned the surface of the sea will seldom if ever undergo the sort of wholesale, violent horizontal displacement described by Bernard Moitessier in his epic book, Cape Horn, The Logical Route (Grafton Books, 1987). Unless a number of severe storms are getting in synch on the unlimited fetch of the Southern Ocean, or unless a small yacht is caught in the dangerous quadrant of a category five hurricane (in which case everything is uncertain) there is always an admixture of moving and non-moving water to play havoc with the tactic of choice. The dichotomy between moving and non-moving water is precisely the thing that makes the issue of heavy weather tactics so difficult to resolve. One could easily render a judgment in favor of "running" in the case of the rapids of the Colorado. One could easily render a judgment in favor of heaving-to in the case of normal storm waves. But what about the not-so normal wave? What about the occasional breaking wave? What about episodic waves that are different from the rest? What about microburst-generated ESWs (extreme storm waves)? What about rogues and mavericks coming from different directions? If a vessel is running unrestrained, and if the entire field of water is also moving with it, there is little to worry about, relatively speaking. But what if the field is stationary but the occasional wave is breaking? What happens then? What happens if the yacht just happens to be at the wrong place at the wrong time? What happens if she is picked up and "captured" by the fast-moving crest of a breaking wave? The memory of Fastnet '79 haunts every sailor. Who can forget those names - Grimalkin and Ariadne, Flashlight and Cavale, Trophy and Gunslinger - names that evoke visions of the most bittersweet melodramas that pit mortal man against the tempestuous sea? What was so startling about Fastnet '79 was that never before had so many people died in so many boats while using all of the traditional storm tactics. One hundred sailboats were knocked down; 76 capsized, many rolling full circle under the water; 5 sank; and 70 had to be towed back to safe harbor. Fifteen lives were lost; 136 sailors had to be snatched out of the gaping maw of death by British and Irish helicopter crews. All the more baffling because these were among the best racing yachts in the world, manned by well-disciplined, resourceful and highly experienced crews. Yet, when the wind and the sea took over, many found traditional survival tactics wanting. The very idea of survival implies an ultimate defense. That is, a last, final and concluding tactic. Mother Nature, for instance, provides almost every creature with its own peculiar form of survival tactic. The fawn, separated from its mother, will instinctively try to hide and lie still at the approach of a predator. Why? In order to optimize its chances of survival. The beetle will roll over and play dead in a similar situation. Why? In order to optimize its chances of survival. The puffer fish will inflate itself into a spiny ball too big for the shark to swallow, and the turtle will withdraw into its shell and wait it out. It must be noted that in all of the instances cited above, and indeed throughout the entire gamut of struggle in the Natural world, the survival tactic that is resorted to last is more often than not a passive one. That is to say, a strategy more conducive to the conservation of strength and resources. At times of severe stress the human body itself is a master of such shut-down-and-conserve procedures. It must be noted, also, that in all of the instances cited above the strategy resorted to affords no guarantee of actual survival. It merely maximizes the chances of doing so. Of course, the gamble may involve a trade-off of some sort. A peculiar species of lizard, for instance, will gladly part with a tail in order to survive, because the creature gains his very life by that trade-off. Besides, he can grow another tail later. In genuine "Fastnet conditions" a sailor may similarly be faced with a trade-off, in which case he must make a choice between the risk which can be reasonably accepted as regards his property (boat), and the risk which must be rejected as unacceptable as regards the lives on that boat. In this connection it was traditionally regarded as more acceptable, beyond a certain point, to abandon the sailboat in favor of a life-raft, thus sacrificing replaceable property in favor of irreplaceable human life. But if Fastnet '79 taught us one thing, it taught us that we should be absolutely certain that a boat is about to sink before abandoning it. Indeed, from 10.00 p.m. of August 13th until 6.00 p.m. the next day, when the air waves filled with maydays and the skies over the Western Approaches were dotted with brilliant distress flares, no less than twenty-four yachts were abandoned by crews who took to rubber life-rafts believing that their vessels were about to sink. Astonishingly enough, however, only four of the twenty-four abandoned boats were actually sunk by the storm. And while many souls perished in or near capsized life-rafts, some of which split apart at the seams, fully nineteen of those abandoned sailboats were found to be still floating and intact after the storm had passed on. Astonishing and difficult to believe. The question that is asked over and over again is, why did all those sailors abandon their boats? Quite likely they abandoned ship because the random and catastrophic motions that they experienced led them to judge the situation untenable. We return to the fundamental question of alignment. Indeed, once disabled, 99% of all sailboats in existence today will fall out of alignment and lie broadsides to the waves, in that vulnerable position subject to the same random and catastrophic knock-downs and "barrel rolls" that did so much damage in the course of Fastnet '79, turning cozy cabins into combat zones ("cottage cheese became a lethal flying object," said one survivor), throwing the crew around inside along with broken glass and battery acid, inflicting injuries worthy of an automobile accident, forcing them out into the cockpit area, there to be thrown violently against the ends of their safety harness lines by boarding waves, or be washed overboard and lost at sea. What then, was the lesson of Fastnet '79? Perhaps the lesson can be summed up in the following words: there is something basic missing in small craft survival equipment. None of the yachts participating in that race had purpose-made sea anchors and drogues on board. In short, those ill-fated sailors had no adequate drag device equipment to align and stabilize the attitude of the boat, making her motions much more predictable, much more stable, much more tolerable, in which case they might have thought twice about abandoning ship in favor of rubber life-rafts. Many life-rafts rely heavily on the drag device (sea anchor or drogue) that they come equipped with. It stands to reason that, with the proper drag device deployed, a yacht itself can become a "survival platform," far sturdier, far better built and far more comfortable, far better equipped and provisioned than the little inflatable one that comes in the suitcase. Fastnet '79 was a milestone in our understanding of heavy weather tactics. Fifteen years later we have another milestone in the form of the Queen's Birthday Storm. In June 1994 a regatta of pleasure yachts left New Zealand, headed for Tonga. En route, the boats were devastated by an unseasonable cyclone. The event coincided with the celebration of Queen Elizabeth's birthday, and has been referred to as the Queen's Birthday Storm ever since. We will not go into the details of the life and death dramas that transpired on high seas. They are described in great detail in other texts and videos, among them Tony Farrington's book Rescue In The Pacific (International Marine Publications, 1996 - recommended reading), and Ninox Films' videographic masterpiece, Pacific Rescue (recommended viewing - Ninox Films Ltd., PO Box 9839, Wellington, New Zealand). Suffice it to say that the Queen's Birthday Storm also involved severe knock-downs, capsizes and barrel rolls. There was one catastrophic pitchpole. Many vessels had to be abandoned, crews risking life and limb and even performing daredevil trapeze acts worthy of the Flying Zambinis to get off their boats. One yacht, the 45-foot sloop Quartermaster, sank outright, with the loss of three lives. Who can forget the utter frustration and incredulous despair in the voice of Quartermaster's skipper, Bob Rimmer, during his all but final radio communication with New Zealand's Kerikeri Radio: "We've just had a second knock-down, Jon.... I don't know what to do...." Who can forget the plaintive tone in the voice of Kerikeri Radio's Maureen Cullen later on, as she tried in vain to raise the ill-fated Quartermaster on the radio: "Quartermaster, Quartermaster, Kerikeri Radio calling, do you copy? Quartermaster, Quartermaster, Kerikeri Radio calling, do you copy?" The silence that followed was haunting. In one respect, however, the Queen's Birthday Storm was different from Fastnet '79: more crews tried to avail themselves of drag devices, makeshift and otherwise. A number of the boats had purpose-made sea anchors and drogues on board, and did manage to use them in earnest. The vessel Destiny's use of the Australian Sea Squid drogue is reported in file D/M-12 of this publication. The vessel St. Leger's use of an American Galerider drogue is reported in file D/M-17 of this publication. The catamaran Heart Light's use of a drogue, as well as a large parachute sea anchor, is reported in file D/C-5. The catamaran Ramtha had a parachute sea anchor on board, Bill and Robyn Forbes having deployed it a day or so before the fiasco in order to make repairs to the steering cables. But they lost the parachute during retrieval and had nothing to deploy when the real storm hit. Victor Elias, owner of a Westsail 43, managed to get some sort of short-lived benefit from a 2.5 foot Shewmon drogue before losing it outright to line chafe. Elias had a Shewmon sea anchor on board as well, but, according to the message that he posted on Compuserve on 30 December '94, "we felt that the conditions were too dangerous to go on deck to deploy it. Instead we motored bow-on. We made it through with little damage, but were very lucky." (No further details available at the present time). Skipper Sigmund Baardsen deployed warps, an old mizzen sail and a dinghy anchor to slow down his 40-foot Offshore yawl Mary T, but the aft windage of the rig caused her to lie a-hull instead. The 32-foot cutter Sofia derived some benefit from dragging looped warps behind the boat. The 44-foot New Zealand yacht Waikiwi II streamed a makeshift drogue made out of automobile tires, but the contraption failed to do an adequate job of aligning the vessel with the prevailing seaway. A number of boats tried to convert sails into sea anchors, one with noteworthy success. After being dismasted, the crew of 42-foot sloop Silver Shadow streamed a #4 jib off the bow, tied like a diaper at the head, tack and clew on 200 feet of rope. They then jury-rigged the storm trysail up on the stern to help bring the boat's head around. Silver Shadow then lay hove-to for the next forty hours without further mishap, her skipper Peter O'Neil emerging as one of the unsung heroes of the Queen's Birthday Storm. Although the 360° roll that dealt the death blow to Silver Shadow had left Peter severely injured and in excruciating pain - broken bones literally grating together in his chest - the relatively stable attitude of Silver Shadow as she lay hove-to enabled Peter to decline immediate assistance in deference to the needs of others in more immediate danger, who had to be taken off their boats as soon as possible. That so many stricken crews would instinctively try to convert sails into sea anchors and automobile tires into drogues ought to convince us that purpose-made drag devices belong in the inventory of every small vessel that ventures offshore. The lesson of Fastnet '79 seems to have been reinforced by the lesson of the Queen's Birthday Storm - the need for suitable drag devices. One needs a suitable drag device to maximize one's chances if one runs into a gale offshore. But there is still some confusion as to what a suitable drag device might be. How does one choose between the various different classes and types of drag devices on the market today? There are, for example, large-diameter, high-drag parachute type sea anchors that can be used to physically anchor a sailboat to the surface of the ocean. There are smaller, low-drag speed-limiting drogues that can be towed off the stern to slow a boat while allowing a fair amount of helm control. These come in a variety of sizes and shapes - in solid plastic as well as various textile and webbing configurations. And then there is the medium-drag series drogue conceived by Donald J. Jordan. The series drogue, composed of a hundred or so 5-inch diameter cones strung on heavy tow rope at 20-inch intervals, is also deployed off the stern, but is in fact more of a sea anchor. It provides just enough drag to all but stop the boat dead in the water, but not as much drag as the true sea anchor that might be used off the bow. In effect, the series drogue places the yacht on "standby mode," ready to yield only to the impact of the rare wave that is actually breaking. The Jordan Series Drogue consists of dozens of 5-inch cones spliced to a long warp. A weight is then attached to the distal end. How does one sort between all these different drag device concepts? One way of doing so would be to build a database of documented case histories and then look for recurring patterns in it.